Alaska's North Slope area is a wide expanse of land that is located north of the Brooks Range and extends to the Arctic Ocean. 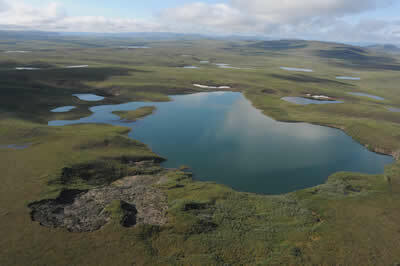 The land is characterized by the surface "active layer" of tundra that thaws during the summer season, while the underlying permafrost remains frozen year-round. Thermokarst is a land feature that develops when this active layer separates from the permafrost, creating distinctive slumps, gullies, and hollows [see Picture 1]. As the climate in the Arctic changes, there is increasing report of thermokarst incidence. The Thermokarst project is a collaborative effort between 11 institutions that studies this phenomenom in the Alaskan tundra. The research is based out of Toolik Field Research Station [Picture 2], which is a University of Alaska-Fairbanks facility nestled approximately 150 miles south of the Arctic Ocean and 10 miles north of the Brooks Range. UNAVCO provided Terrestrial Lidar (TLS) support to PIs Mike Gooseff (Penn State) and Ben Crosby (Idaho State) for the duration of the summer. Their group has been scanning 3 thermokarst sites close to Toolik with the goal of measuring rates of degradation and characterizing the parameters that dictate when and where thermokarst will occur. UNAVCO provided the Lidar scanner and a field engineer for 10 days in late June and early July. The research team was trained in the field on how to operate the scanner and how to create preliminary point clouds for data quality review. The group will continue scanning their thermokarst sites through August. Figure 1 - The degraded landscape in the bottom left corner of the photo is one of the thermokarst sites that was scanned. The data will determine the rate of degradation, as well as providing topographical information that may help researchers. 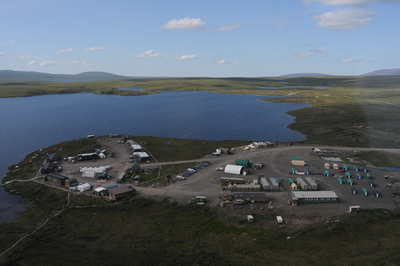 Figure 2 - Toolik Field Research Station is nestled against Toolik Lake on Alaska's North Slope. Approximately 100 researchers spend a portion of the short summer season conducting field studies pertaining to the Arctic. Figure 3 - Researchers Ben Crosby and Sarah Godsey set up a scan amidst a sea of mosquitoes.